Awaken Chiropractic offers top-notch chiropractic care in Parker, Colorado and nearby areas, and is pleased to announce the launch of a new blog section for its website. Now both existing and potential clients can enjoy easier and quicker access to information about various services such as pediatric, pregnancy and family chiropractic, and to schedule a convenient visit to the office. Unlike the techniques of conventional medicine, which focus on treating pain or illness, the quality chiropractic care provided at Awaken Chiropractic greatly emphasizes the importance of enhancing health in a targeted effort to lower the risk of illness and pain in the first place. Awaken Chiropractic uses state of the art technology and innovation to provide fast relief from pain caused by traumatic events such as improperly lifting a bulky object, or through repetitive stresses. Their techniques treat problems with tendons, muscles, ligaments, nerve and fascia. From back pain treatment to chiropractic for children, Dr. Alex Willard of Awaken Chiropractic is committed to offering effective and high quality chiropractic care to help his patients bring their body back to the natural state of wellness and health. They see pregnant moms for common complaints like low back pain and sciatica, which actually helps reduce delivery times and delivery pains. 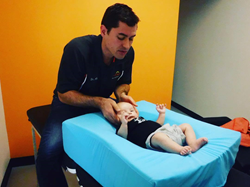 Awaken Chiropractic also helps babies stay healthy through wellness care and by treating issues like infantile reflux, bed wetting, and ear infections. Awaken Chiropractic is based in Parker, Colorado. Their mission is empowering the locals in Parker as well as the surrounding Denver metro area communities to reach their maximum potential with a non-invasive, holistic, and whole-body approach to wellness and health by offering the best, state of the art chiropractic care available in the region. They use only the latest techniques and information, ongoing education, advanced technology and research to offer the best in care to your whole family. They are well-known for their Torque Release Technique. Choosing top-notch chiropractic care through Awaken Chiropractic will not just let you feel better and healthier; it will also improve your overall quality of life. Your health and well-being is their mission.